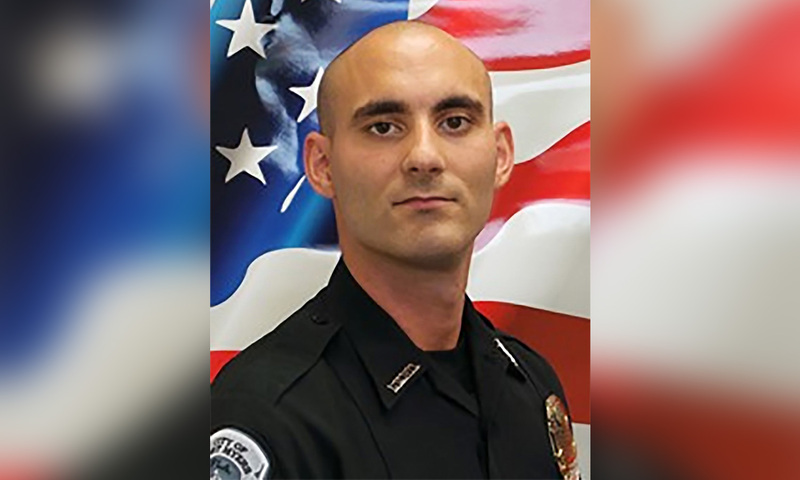 FORT MYERS, Fla. – A Fort Myers police officer died Saturday a week after he was shot in the head while trying to apprehend a fleeing suspect. “We lost him,” police Capt. Jay Rodriguez said after a number of police cars suddenly raced to Lee Memorial Hospital around 6 p.m. Friday. Jobbers-Miller had been in critical condition since Saturday night when he was wounded while chasing a suspect in the reported theft of a cellphone from a car at a Marathon Service Station. Jobbers-Miller was the only officer injured during this incident. The suspect, Wisner Desmaret, was also injured and remains in custody at Lee Memorial Hospital. Under gray skies and a steady drizzle, dozens of police officers gathered and hugged each other in front of the auditorium at Lee Memorial Hospital as the somber news of Jobbers-Miller’s death spread throughout Southwest Florida’s law enforcement community. Before moving to Florida to pursue a career as a police officer, Jobbers-Miller worked as a volunteer firefighter in Wayne, New Jersey, a small town about 20 miles from Midtown Manhattan. On Friday evening in Wayne, the Fire Co. 2 house Jobbers-Miller once called home was packed for a vigil, as family and friends held candles and remembered the former township resident. “When Adam joined (Co. 2) in 2009, it was an honor being his chief and to watch him grow into such a devoted, dedicated firefighter,” said Fire Co. 2 Chief John Gabriel said. Jobbers-Miller feared nothing, said Gabriel. The drive and motivation led Jobbers-Miller and one of his sisters, another former Wayne volunteer firefighter, to join the Fort Myers Police Department. A GoFundMe account established for Jobbers-Miller’s family had reached more than $56,000 by Saturday night. Numerous local businesses have held or scheduled fundraisers and volunteers nearly overwhelmed Lee Health Blood Centers after it called for blood donations.